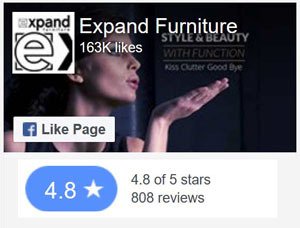 Why Shop with Expand Furniture? We pride ourselves on the quality of every item we carry, we work very hard to make sure we only have the best. Our tables come with 500 day warranty on all mechanical parts and our wall beds with 5 years warranty on all mechanical parts. Even if somehow something went wrong after the warranty period is over, we will be happy to try and send any replacement parts at cost, or for free if we are able to. Rest assured with our satisfaction guarantee, if you aren’t overjoyed with something, let us know and we will be at your service. Do you deliver inside? Up stairs? Yes most products will be delivered inside your home provided you have an elevator or ground access. If you have stairs please let us know ahead of time before you order. While we do have a showroom in Vancouver, we are primarily and online company and do not operate other retail stores or distribute through partner stores. We encourage all of our customer to view our images and videos online and you can email us if you would like any more details. While we maintain this model we are able to provide better pricing to our customers and hold inventory in our North American warehouses for faster delivery times. Although we primarily operate in Canada and the United States we have the ability to ship most tables worldwide including Europe and Asia. We have shipped to the Philippines, Singapore, Hong Kong, Australia, Mexico, the UK, Scandinavia and more. Please contact us for specific details. Warranty lengths are stated on each individual product page. Most Wall Beds come with a 5 year warranty. Most tables come with 500 days warranty. Warranty covers mechanics and hardware and not superficial damage or wear that might be caused by customer use or lack of care. If you disassemble mechanical parts this may void the warranty, always contact us before doing so. If our customers somehow don’t love their products, then we aren’t happy either. You may return most products within 7 days of delivery. Refunds will be processed after items are received and inspected. Shipping charges are non refundable, so the cost of return shipping will be subtracted from the refund. Wall beds, Mezzanine, Cabinet Beds and FlexYah Bench products are final sales. If an item arrives damaged we have the right to repair or replace. Please inquire for further details on specific items. Products must be placed back in original packaging and not be used to guarantee a 100% refund. In the rare case of unusual customization (special orders), we may not be able to guarantee a full refund. Some items are not returnable, please see return policy. Clearance items are non refundable. We double check every item before we send it out, as well we package everything very carefully with extra padding. However if your item is damaged in shipping or defective upon arrival we will either have it repaired if its minor or arrange to have it returned and we will send out a replacement as soon as possible at no cost to you. If your item arrives damaged it needs to be reported immediately, do not hesitate to email or call us. Do not discard the packaging as we may need it to make an exchange. Photos may be requested to help to assess the issues. We offer volume & bundle discounts. If you are purchasing multiple items for a project, please inquire or choose one of our ready made bundles like the dining sets which have discounts already applied. When purchasing in a bundle, discounts are applied to make the costs lower than the individual product costs. If you decide to return part of the bundle package you will not be returned full item value as these items were all discounted for volume. Return value will be calculated by the retail value (before discount or coupon) of all kept items subtracted from the order total. 2 Way shipping will then be subtracted from the return value for the items being returned. This measure is put in place to stop over ordering items to receive discounted rates only to return the extra items that resulted in discounts. Why won't the shopping cart ship to my country? Some products and countries require custom quotes to determine shipping costs. Please inquire and once we determine a rate to your city or country we can open up our cart to accept your order. 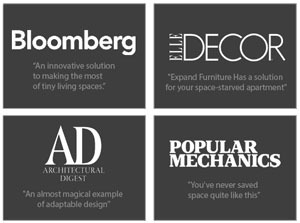 Certain large items such as Italian Wall Beds or MurphySofa Wall beds will require custom quotes. We reserve the right to charge additional shipping in rare circumstances where a product is being shipped to a remote location. Do we do price matching or have additional products not on our site? We are confident in our product selection, quality and price. Quality makes a big difference with mechanical items and we pride ourselves on our excellent hardware and build quality and this is why we back our items with such great warranties. If you think you can find a similar quality product at a better price from a reputable company, we will do our best to be competitive on pricing. If there are any finishes, colors, styles or even products we do not currently carry and you want us to, just let us know and if we can’t get you that product we will try our best to find someone who can. We try and keep all of our space saving tables and MurphySofa wall beds in stock, so we are able to ship them to you as fast as possible. If you need customization, or an item is out of stock, these products can take around three months to be produced from scratch. Not a problem, we often keep our most popular items in stock and ready to ship. If a product is not available and you have a quickly approaching deadline, please contact us and we can try and find a solution for your space. We are able to expedite production, use faster delivery or come up with alternative options.